﻿ Imagine being a Dashboard Confessional fan in 2018. Not only does that come with the internal crises of actively enjoying the musical equivalent of saccharine water, but it also means that you’ve been waiting nine years for Chris Carrabba to drag himself away from his other projects that have filled his time for the better part of a decade, and actually get some music made. And when the end result is Crooked Shadows, the easiest reaction to imagine is disappointment to only nine tracks clocking in at about half an hour. Granted, depending on who you ask, that mightn’t be seen as a blow at all, but if that was all that’s wrong with Crooked Shadows, you could at least picture a half-decent album. Instead, Carrabba takes an already meagre sound and commercialises it even further, even as quivering, acoustic emo, rinsed-out pop-rock devoid of colour or spark, or, on the Cash Cash-produced Belong, an electro-pop cut that has no business being here and adheres to the genre’s most derivative stripe to the letter. None are engaging, the production makes everything feel even more lightweight and anaemic, and for an album as royally starved of content as this, the fact that Carrabba’s breathy, faux-sensitive smolder still outstays its welcome is a genuine achievement. To be as complementary as possible, Catch You is an okay if overworked pop-rock song, but compared to how safe and neutered everything else is, it’s not hard to isolate it as a sole highlight. Open My Eyes is a disgustingly syrupy track thanks to Lindsey Stirling’s violin line that’s slathered on top for that Disney ballad feel, while We Fight and Just What To Say are the underweight bookends that offer nothing different from the meat between them. But even if the instrumentation is – to put it mildly – lacking, the main selling point of Dashboard Confessional has (apparently) always been the writing, where Carrabba prostrates himself and lays himself bare in a way that a primarily teenage audience would find easy to drink in. Crooked Shadows is no different, and while such shameless pandering is embarrassing in its own right, the fact that this is coming from a 42-year-old man trying to make 42-year-old man things relatable to teenagers is beyond redemption at this point. As much as tracks like We Fight and Heart Beat Here are intended as older, more well-worn sentiments of come-up and safety in a relationship respectively, they’re so bland and unspecific that they could easily be another pair of half-baked ballads grounded in another boring, fictitious struggle whose only purpose is to be empowering. Then there’s Belong, the wafer-thin stab at summer radio play that mashes together as much imagery of love and freedom as it can that ends up in total nothingness. And that’s a nice way to summarise Crooked Shadows on the whole – nothing. There is absolutely, positively no reason to this album to exist, especially in its current pared-down, underfed state that was as much of a waste of time to record as it is to listen to. And really, from a band who have seven albums under their belt at this point, Dashboard Confessional should have learned how to actually grow into their music rather than throw out rushed, one-dimensional pastiches of it. The one unequivocal positive is that, currently, Dashboard Confessional are too irrelevant for any significant fuss to be made about them; if Fueled By Ramen cared enough to give them the same promotion as Twenty One Pilots or All Time Low, this could have been the worst thing ever. 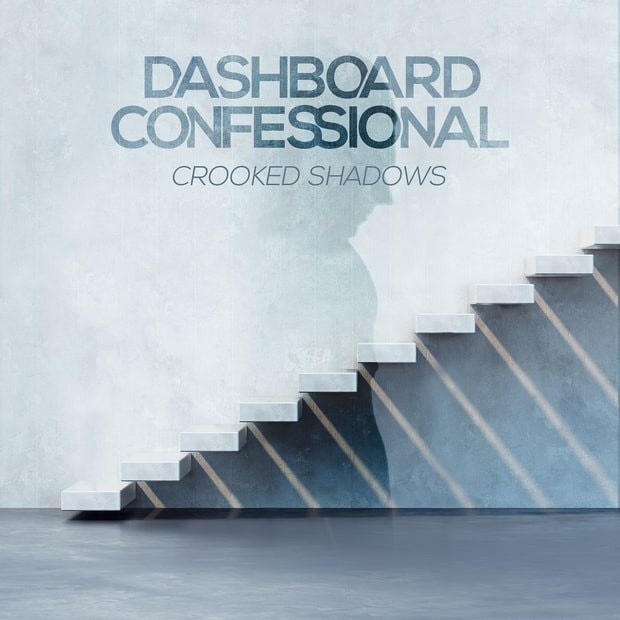 ‘Crooked Shadows’ by Dashboard Confessional is out now on Fueled By Ramen.